Fairborn’s Darby Ballard (left) tries to hit past the block of Xenia’s Camille Hughes (10) and Heidi Alex (7), during Tuesday’s girls high school volleyball match at Xenia High School. Xenia rallied to win the match in four sets. Xenia’s Tristen Conner (4) sets up to clout a shot from the left side against Fairborn defenders Ella Whalen and Brittany Hogan, Tuesday Sept. 4 at Xenia High School. 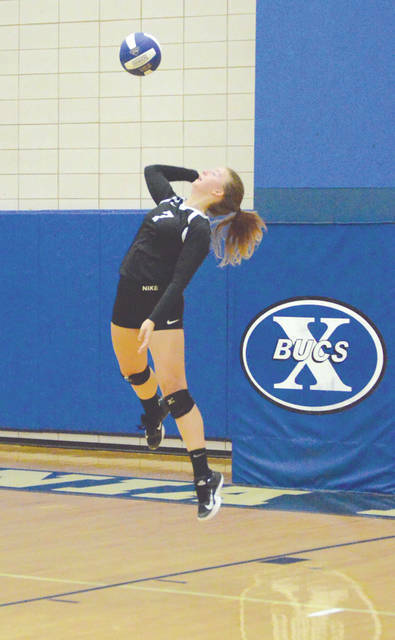 Buccaneers senior middle blocker Heidi Alex served up a match-high five aces in the four-set win over visiting Fairborn, Sept. 4 at Xenia High School. 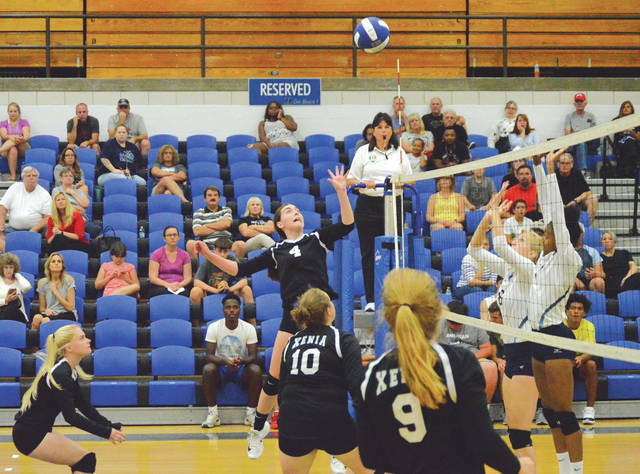 XENIA — Host Xenia High’s girls volleyball team learned they could compete against Fairborn after a narrow first-set loss, Tuesday night Sept. 4. The Buccaneers then learned they could win from then on. 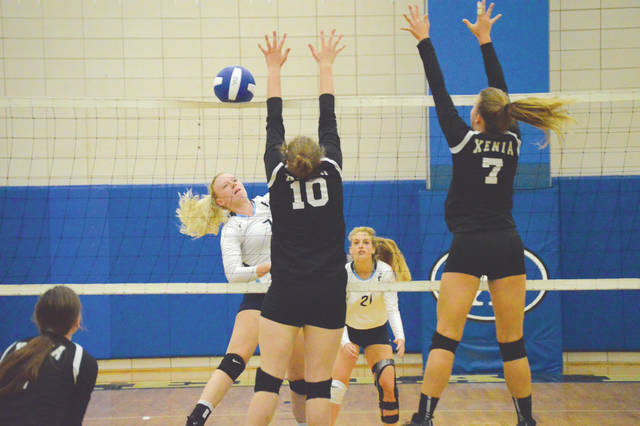 Xenia rallied to claim a 20-25, 25-20, 25-17, 25-22 win over Fairborn, a team that had entered the match undefeated against Greater Western Ohio Conference, American South division opponents. Things just got a bit more crowded atop the GWOC South standings. Depending on whether West Carrollton won at home against Stebbins, there now could be a three-way tie for first. The visiting Skyhawks (3-4, 3-1 GWOC South) never gave up the lead in the opening set, but they never truly blew out Xenia in the set either. The Bucs (4-2, 3-1 GWOC South) had pulled to within two points (21-19), but a Xenia net violation, a Katie Knapp Skyhawk service ace and a kill by Lee Ann Williams gave Fairborn the eventual 25-20 opening set win. It was Xenia who led throughout the second set, and Fairborn was the team to draw within 21-19. But Heidi Alex’s soft-touch score on a dink followed by a service ace from Bucs teammate Skylar Throop earned Xenia a 25-20 set win to knot things up at one set apiece. Xenia gained its confidence in the third set. The Bucs capitalized on a series of opening Fairborn miscues to grab a 5-0 lead. Xenia led at one point, 20-8, but scores by Fairborn’s Darby Ballard, Hani Sampson and a service ace by Jessica Black inched the ‘Hawks to within five points at 22-17. That’s when an Alex dink, Camille Hughes block, Tristen Conner kill and a Haley McManus ace closed the third set in the Buccaneer’s favor, 25-17. In the fourth, it looked as if Fairborn had regained its composure and was about to knot things up at two sets each. Behind Williams’ serves, the Skyhawks rolled out to an 8-1 lead in the set. They led 20-14 despite a pair of diving dig saves by Xenia’s Throop. Hughes followed Throop’s hustle with a kill, the two teams traded net serves, then Bailey Oliver, Hughes, and Throop each recorded consecutive kills to pull Xenia within 21-19. After Fairborn’s Ballard bashed a right-to-left shot into the Blue Pit floor to make the score 22-19 in Fairborn’s favor, scores from Hughes, Conner, Throop and Conner again gave the Bucs the lead, 24-22. A Fairborn net violation gave Xenia the final match clinching point. Unofficially, Alex led everyone with nine kills, four service aces and a block. Conner also had a good game for the Bucs, finishing with nine kills and an ace of her own, and Hughes finished with five kills and a block. Williams led Fairborn with eight kills and an ace, Black had six kills, an ace and a block, and Sampson had six kills and an ace for Fairborn. Xenia doesn’t get any rest. The Bucs will host Greeneview for a nonleague county battle at 7 p.m. Wednesday, Sept. 5.